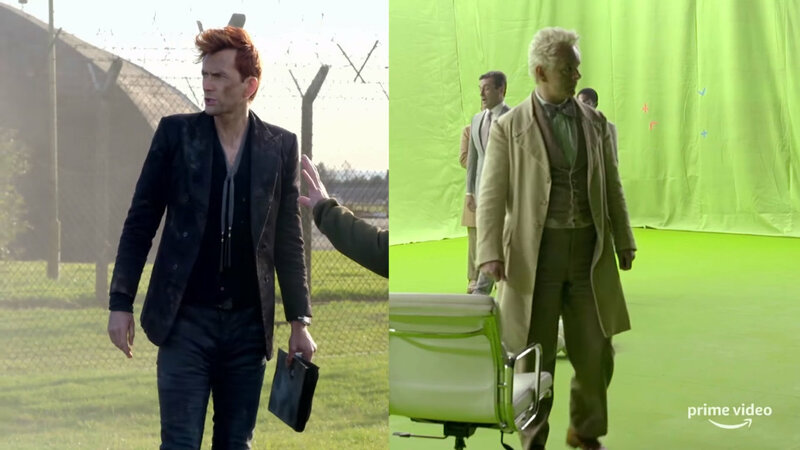 It's fair to say that the Amazon Prime panel caused a big buzz yesterday with the unveiling of the first sneak peek behind the scenes of Good Omens. The six part adaptation of the much loved comic novel by Neil Gaiman and the late Terry Pratchett will arrive on Amazon early next year, but fans have been sharing their enthusiasm about seeing the stars of the show, including David Tennant, Michael Sheen, John Hamm, Miranda Richardson and Michael McKean, in costume and on set. Good Omens is a comedy set on the verge of the Apocalypse. As the forces of good and evil gather to fight the Final Battle, an angel called Aziraphale (Michael Sheen) and a demon called Crowley (David Tennant) join forces to prevent the end of the world. They're joined by a modern day witch, a clairvoyant and part time courtesan, the last remnants of the Witchfinder Army and a gang of four children, one of whom may well be the Antichrist! Neil Gaiman, who wrote and produced the show, along with director Douglas Mackinnon, also chatted to Entertainment Weekly's Devan Coggan yesterday about the process of developing, casting and shooting the show. On their stars, Neil Gaiman said, "What’s amazing is that when you put [Michael Sheen] and David together on the screen you get something special. I gave them good lines and Terry gave them good lines but they brought the magic. It’s that chocolate and peanut butter thing where they taste good individually but you put them together and now you’ve got something special." Douglas Mackinnon added, "It’s kind of like Butch and Sundance and Thelma and Louise all together, a mix that you can’t believe, it’s like treasure trove stuff. Putting them together, it’s Scotland’s favourite actor and Wales’ favourite actor together on screen for the first time. They were magical from the read through forwards, at the read through you could actually see them becoming a team. And it’s just there on the screen, that thing that you can’t really specify why it works, but it just works a treat." Also, John Hamm is fantastic as 'appalling angel' Gabriel, an expanded character from the book. Michael McKean was originally being considered for a small role but was offered the role of Sergeant Shadwell after Neil Gaiman saw him performing on Broadway. Douglas Mackinnon gave him tips on his Scottish accent on set. Neil states that it was not hard to update the story to 2018, though one change was that cassettes in cars have become CDs. However, a key theme has stayed - you could not do Good Omens without the music of Queen! Fans are promised favourite scenes and changes in the adaptation. Neil says, "It’s quite possible that your favourite line is not in this because your favourite line is in the book. But by the same token we promise that we will give you moments, if you are a Good Omens fan, that you will treasure and delight in because it’s stuff that was happening offstage in the book, or it’s stuff that’s alluded to that you never actually see, and here we get to see it." For instance, episode 3 will include a history of Aziraphale and Crowley, showing them at various stages in their relationship, at the Crucifixion, the Ark, the French Revolution, World War I and at the Globe Theatre. Viewers will also get to see Crowley's acquisition of his thermos flask of holy water. Neil says that his favourite scenes to shoot were those in Aziraphale's bookshop, a million pound set constructed especially for the production. The bookshop is ultimately burned down, with Crowley inside, the shooting of which caused controversy amongst some of David's fans. Neil said that he received, "...the closest thing to slightly unhinged and worried people sending me threats". However, as Douglas assures people, the shoot was managed carefully: "He survived. He only got singed a little bit". Neil admits that he became teary while viewing the first rough cut and reflects on his promise to the novel's co-author, Terry Pratchett, who died in 2015. "We made it for Terry. I made it for Terry. I think he would have liked it, I think he would be pleased with what we made." Good Omen will premiere worldwide on Amazon Prime in early 2019.